Dandenong Shire began as a road district in 1857 and became a shire in 1873. Its area of 156 sq km extended from the Dandenong Creek to Port Phillip Bay at Aspendale and Carrum. The shire thus followed the south-westerly flow of the creek as it emptied into the Carrum Swamp, a vast summer livestock grazing area and a morass in colder weather. The swamp underwent draining in the late 1870s, mainly by the Patterson Cut (Patterson River) which took the creek through to the bay. The shire also included Springvale, Keysborough and Noble Park. In 1955 Springvale and Noble Park Shire was created by severance from Dandenong Shire, leaving the latter with 36 square kilometres. By then, however, the Dandenong region had significant industrial growth, with the three big Heinz, International Harvester, GMH factories in neighbouring Berwick. Country town shopping was transformed by hardware, furniture and clothing chain stores opening along Lonsdale Street. Many European migrant families settled in new suburbs, and the story of the city's postwar growth is told in the entries for those suburbs (see further reading below). Between 1961 and 1991 Dandenong city's population more than doubled. 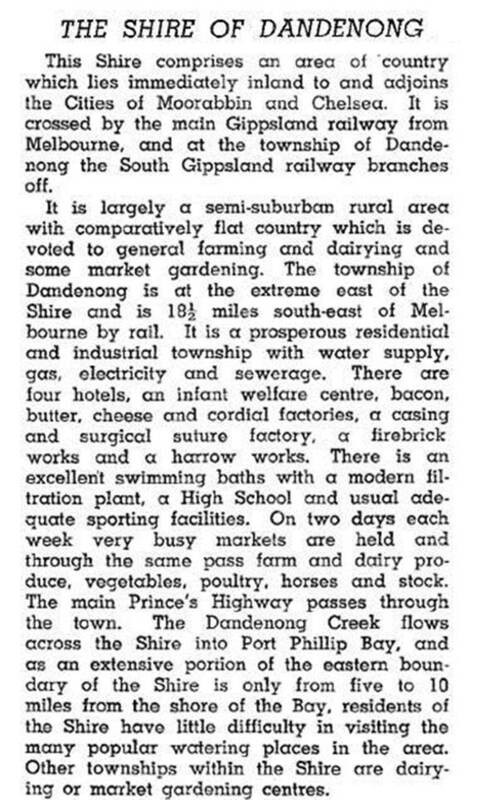 In 1959 Dandenong Shire was proclaimed a city and in 1994 Dandenong city was reunited with much of the area severed for Springvale and Noble Park Shire, and the resultant city was named Greater Dandenong (see separate entry).